Spring Show…!!!? Ironic or what?! When we arrived at Olympia we were ushered into the car park, given a trolley and pointed in the direction of the closest lift to our stand. It is a well oiled machine that really highlights the chaos of some of the other events. Set up didn’t take too long (I only had a 2m square space), and was the usual fun and camaraderie that I love about this business. People smiling and greeting friends – all slightly incredulous and anxious whether anyone will brave the weather over the next few days? As the snow was coming thick and fast I decided to go home and catch the last of the daylight hours with my children who were bursting with excitement! 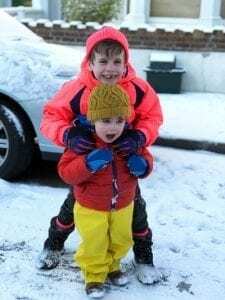 We had a street snowball fights with neighbouring families but after an hour it was too much for my little one who had been forcibly strapped into his gloves and was cold and fed up. Day 1 was unsurprisingly very quiet. Having said this, looking back it was actually my best day. I think that people who had braved the snow were die-hard knitters and were not going to go away empty handed. I also think that cold weather is good for business as it reminds knitters that they can be smug about having several warm and snuggly items that they have made themselves. 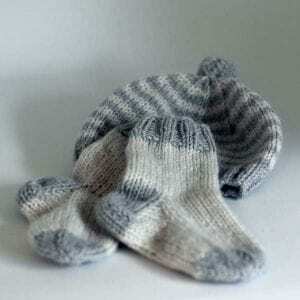 I sold 5 Single-Stripe Knit Kits, and even a Justified Knit Kit. However, with it being so quiet it also gave me a chance to walk around and chat to some of the other stall holders too – we were next to Michelle and Simon from The Loveliest Yarn Company, which was lots of fun. Michelle is always hugely entertaining, and makes me realise that I am a part-timer who has so much to learn! She also made me the cutest pair of cashmere baby socks to add to my collection of baby items. The pattern is her own so I have added the kit to my website – really though – how cute are these?? Best still is that you can make at least 1 pair from 1 x 25g ball. Alternatively if you want to make them in two colours like these, you will also have enough to make a matching BamBeanie Hat! 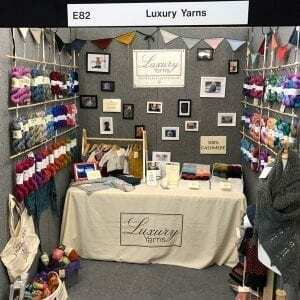 I also had a chance to chat to infamous Louisa Harding from Yarntelier – the other cashmere brand 😉 Fortunately our products are not very similar and we don’t overlap on yarn weights at all. 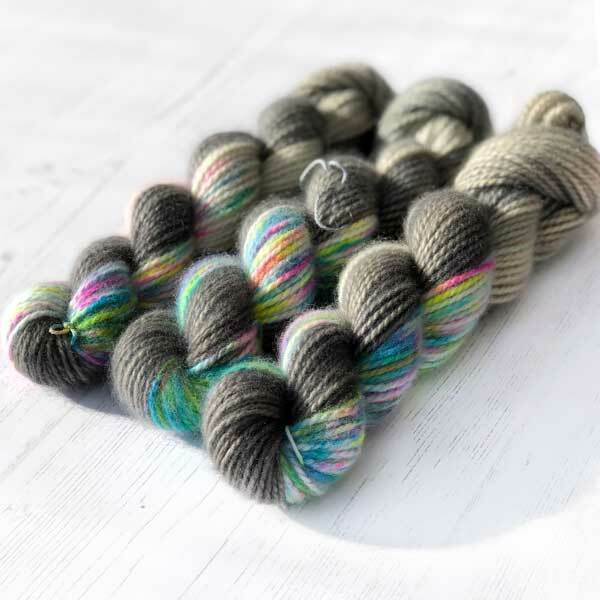 I do love her lace yarns and would be tempted to stock a lace weight cashmere, if she didn’t do it so perfectly herself. Her patterns are amazing too and I would never try and compete… I would fail! I got chatting to fabulous knitwear designer Bronagh Miskelly, who has very kindly agreed to let me sell her Coolmore Creek Wrap with my Queen Silk Lace. I am just having a sample made at the moment so no photos as yet but I can’t wait to see what it looks like – it is going to be GORGEOUS! The weather had improved by Saturday and the people came out in their hoards. It was really busy and interestingly was the day I sold the least comparatively. It just proves to me that you can never tell how you are going to do at a yarn fair. I remember last year at one fair we took almost 5 times the amount on Saturday that we did on Sunday, but had the same number of sales. I sold a lot more Queen Silk Lace though, and have sold out of my most popular colour-ways. 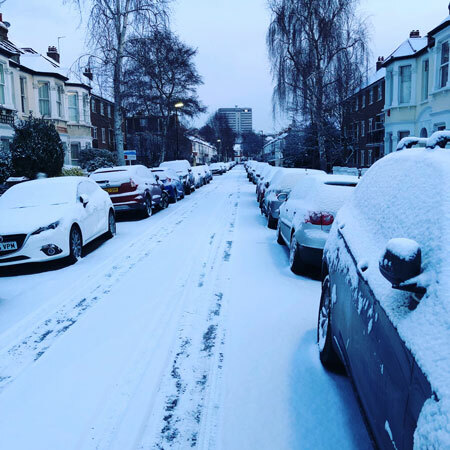 I think the thaw reminded people that Spring really should be just around the corner… Luckily my husband is travelling to India next week on business and will be able to bring back my next order in person! Thank you to everyone who came and said hello. I really loved it this year and had so much fun.